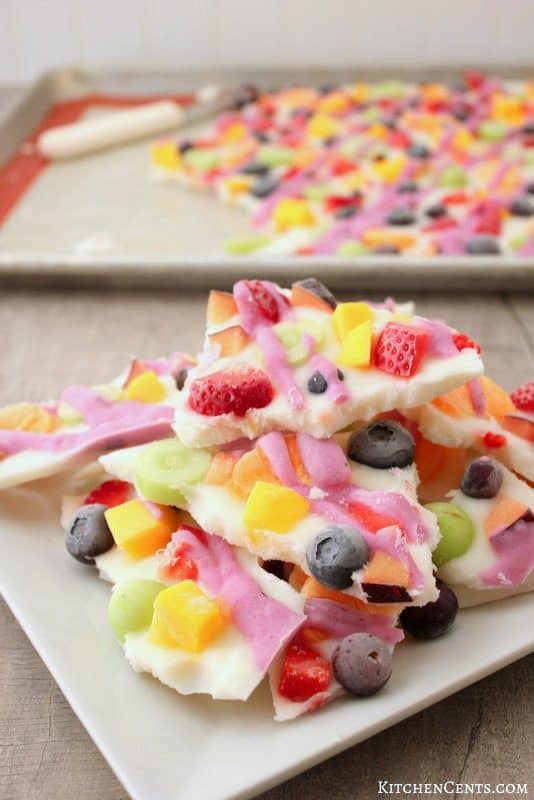 If you need an easy, healthy snack your kids will love, this Healthy Frozen Yogurt Bark is fantastic. No sugar added and only 3 ingredients (if you count the fruit as one), this sweet and tangy treat will be a hit with everyone. Its vibrant rainbow colors and “popsicle” qualities make this healthy treat a delicious snack any day! My girls love frozen treats especially when it’s fruit flavored. They love popsicles, frozen Go-Gurts, frozen fruit. If it’s frozen, they like it! BooBaw, my 2nd oldest, can down 2 or 3 frozen Go-Gurts for breakfast any day and my LouLaw will eat a whole 12oz bag of frozen raspberries if I let her. With all its rainbow colors this frozen yogurt treat is perfect for St. Patrick’s Day coming. We love it and I think you will too! Check out my little demonstration video on how EASY this is to make! Here’s my little LouLaw enjoying a piece of this delicious rainbow-colored yogurt bark. When she took a bit, she said “Mom, this is soooo good. 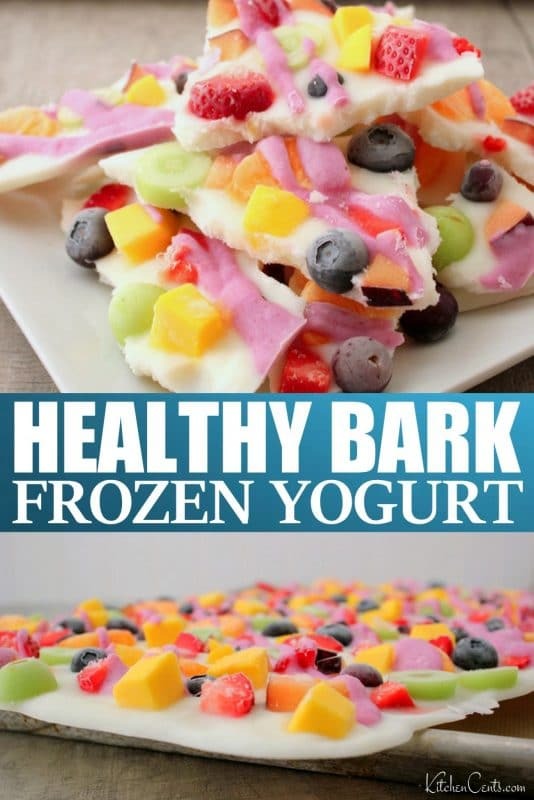 I love it so much!” If that doesn’t convince you that this frozen yogurt bark is delish, I don’t know what will. 😉 This babe doesn’t lie! This fresh fruit frozen yogurt treat is a perfect snack for all the popsicle fans out there. My kiddos included. It sweet and tangy, full of fresh fruit, no sugar added and frozen. Mmmmmm! It’s sooo yummy. 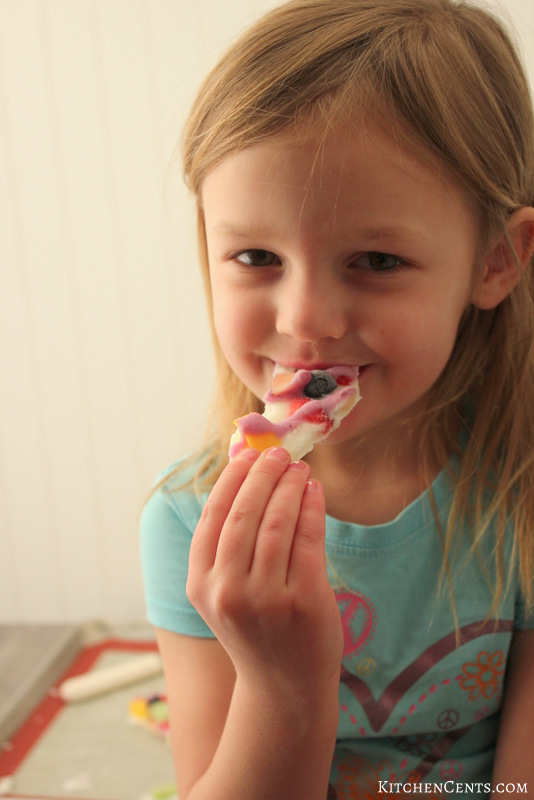 A HEALTHIER ALTERNATIVE TO POPSICLES & A FUN WAY TO ENJOY YOGURT! As a mom, I love this recipe because it’s ingredients are clean and fresh. I love it when I don’t have to be the “meanie mommy” who says “NO!” when the kids as me for a second or third piece. I can say YES! without feeling like I’m pumping them full of sugar or high fructose corn syrup. I love that! Another great thing about this cold sweet treat is, it only takes about 5 minutes to throw together, and then you let the freezer does the rest. WHAT’S IN THIS FROZEN YOGURT BARK? This easy snack only has 2 ingredients in yogurt is one and fruit is the other. 😉 Pretty simple, right? I chose to use red strawberries, Cutie oranges, yellow mango, green grapes, blueberries, and a plum. I drizzled blueberry yogurt over the top for a little extra purple but you could skip it if you don’t have or what to use it. 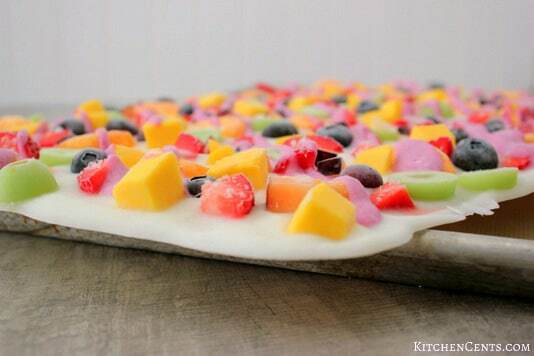 What other fruits would you add to your frozen yogurt bark? 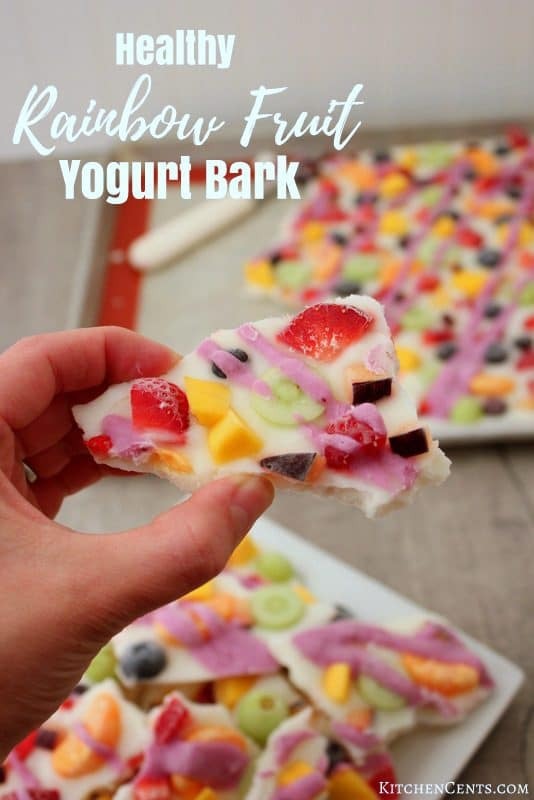 HOW DO YOU MAKE THIS FROZEN YOGURT BARK? 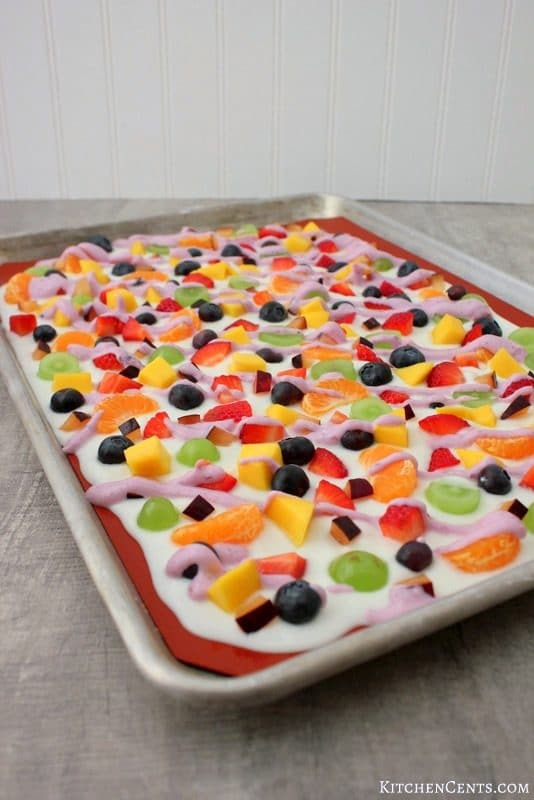 After cutting all the fruit into small chunks, spread the yogurt onto a baking sheet lined with a silicone mat. The silicone mat makes the frozen yogurt release with ease. Then, evenly sprinkle each kind of fruit over the yogurt. Once the yogurt is topped with the rainbow-colored fruit, use a plastic bag to pipe the blueberry yogurt over the top (if you so desire). Doesn’t it look so pretty with all the different colors of fruit? 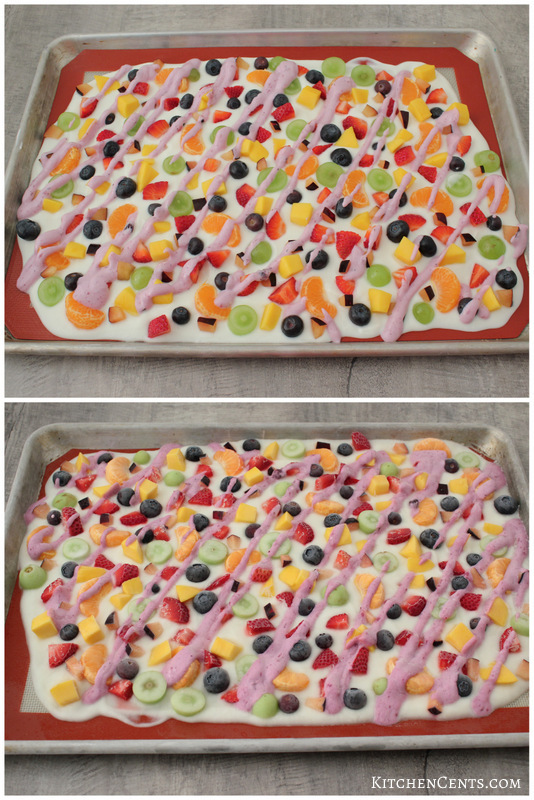 Once all the fruit and yogurt is on the cookie sheet into the freezer it goes. 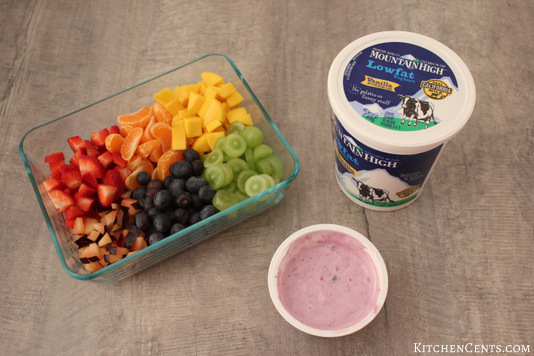 Leave in the freezer for a couple of hours until the yogurt and fruit are frozen through. Here’s a before-and-after freezing shot. It’s such a beautiful, vibrant treat. Once it’s frozen, break it into smaller pieces. Enjoy a few pieces now than place the remaining pieces into a Ziploc back for later. Make sure to store extras in the freezer, of course, otherwise they will melt and become a thawed rainbow fruit parfait minus the granola. Now, when your little ones what a treat, you can be super parent/grandparent and reach for these babies! Delicious, tangy, HEALTHY frozen yogurt treat. This frozen yogurt snack is fabulous as a healthy treat, breakfast or even a dessert. My girls enjoy eating them at all of those times and any other time they can get their little hands on a piece. Then again, who wouldn’t?! This quick frozen treat is an awesome addition to our freezer treats and sweets. It’s cold, delicious, full of fresh ingredients, and my kids LOVE it. That’s my kind of treat! Hi, Debbie! This recipe will make a cookie sheet full and you’ll use about 36-37oz of yogurt plus whole fruit. If you consider 4-5oz of yogurt to be a serving plus fruit, I’d say this recipe makes 7-9 servings. Hope this helps. Thanks for stopping by! I love how pretty this looks and so full of yummy fruit. I can’t wait to try it!